We’d love your help. 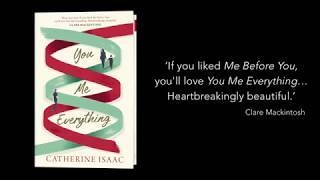 Let us know what’s wrong with this preview of You Me Everything by Catherine Isaac. Jess and her ten-year-old son William set off to spend the summer at Château de Roussignol, deep in the rich, sunlit hills of the Dordogne. There, Jess’s ex-boyfriend—and William’s father—Adam, runs a beautiful hotel in a res Set in the French countryside on an idyllic summer vacation, a delicious, tender novel about finding joy and love even in the most unexpected places. To ask other readers questions about You Me Everything, please sign up. What is it about books with pronouns in the title? "Everyone's future is uncertain. Most of us don't think about the fact that we could be run over by a bus tomorrow. We plod through life, taking every 4.5 stars for this one. "Everyone's future is uncertain. Most of us don't think about the fact that we could be run over by a bus tomorrow. We plod through life, taking everything for granted." Ever since he showed up late for the birth of their son, smelling of booze and with lipstick on his collar, Jess knew Adam wasn't for her. She should have listened to him when he told her he wasn't ready to be a father, but he had told her he loved her, so she thought that would triumph over everything. But it didn't, and she was fine letting him go, even though the burden of being a single mother wasn't the easiest." Adam has tried to be a good father to William, but it's never seemed to be his number one priority. And again, that hasn't really upset Jess too much—she, along with her parents, have raised a handsome, well-adjusted boy. But now that William is 10, she's realized that he needs to get to know his father better. Bowing to pressure from her mother, Jess and William are heading to the French countryside to spend the summer with Adam at the hotel he operates in a restored castle. It doesn't take long for William to become utterly enamored with his father. Adam enjoys having William there with him, but he's still not ready to give up the rest of his life for his son. He has a new, beautiful, younger girlfriend, and he doesn't quite understand that when you make a promise to a 10-year-old, he expects you to keep it—you can't just reschedule in order to spend time with your girlfriend. Even though Jess still bears some old hurts from her relationship with Adam, she is bound and determined for him and William to grow closer, but she isn't willing to tell anyone why this is so important to her. Jess has a fear she has been hiding from nearly everyone, and she can't tell the truth, for fear she might lose everyone she loves. And as her feelings for Adam grow more jumbled the more time they spend together, she knows she has to keep him at long distance, for everyone's sake. "When life is tough, as it will be for all of us, you have a duty to yourself. To live without regrets." You Me Everything is one of those poignant, heartwarming tearjerkers that might not break new ground, but it's tremendously compelling. I read 90 percent of the book yesterday in just a few hours, and woke up early this morning so I could finish. Even though the plot is familiar, I found all of the characters really engaging, so I was very invested in seeing their stories through. Isaac makes her American debut with this book, and her storytelling is tremendously assured. She does a great job with imagery—you can almost picture the French countryside where the book takes place and experience the adventures that Jess, Adam, and William go on. I was hooked from start to finish. You won't want this one to end. This will be one of those books you need to grab quickly for the beach, the plane, the hammock, or wherever you want to devour it. Set in the French Countryside Sick of his lies, cheating ways and complete lack of interest in fatherhood, Jess left her boyfriend, Adam, only months after she gave birth to their son. Adam moved to France to follow his dream, unencumbered by a series relationship and a child he never wanted. Ten years later, Susan, Jess's mother, lies in a nursing home, battling a debilitating disease. Susan forces Jess to recognise that William needs his father in his life. Jess and William spend the summer at Set in the French Countryside Sick of his lies, cheating ways and complete lack of interest in fatherhood, Jess left her boyfriend, Adam, only months after she gave birth to their son. Adam moved to France to follow his dream, unencumbered by a series relationship and a child he never wanted. Ten years later, Susan, Jess's mother, lies in a nursing home, battling a debilitating disease. Susan forces Jess to recognise that William needs his father in his life. Jess and William spend the summer at Chateau de Roussignol where Adam runs a beautiful hotel. She hopes that when Adam meets William, he will fall in love with his son. I did like this book, there was just something missing for me. I could not connect with the main characters. The devastating descriptions of the effects of Huntingtons Disease are very well written. Adams behaviour is a bit immature. I'm sure lots of readers will disagree with me and will really enjoy this book. Ohh, what a wonderfully written and emotional book - I didn't want to stop reading, despite the tears (I do cry easily but even so, this was a heartwrencher!). Catherine Isaac's writing feels so like real life - in many ways but, at its heart, just in the way she portrays dialogue and actions - it all feels natural and so convincing. The situation - Jess trying to get her ex (and father of her child) to bond at last, whilst dealing with her own problems and those of her family too - I don't want to give too much away so will leave it at that - is one that no doubt many people have experienced, and it's all portrayed so realistically. I also love the characters in this novel. Jess is lovely, strong and the kind of person who deals with things so well considering what she has to worry about - definitely an inspirational main character! In fact, the other characters are also so interesting to read about. I really like them all... even Adam, despite his MANY faults. You can see why Jess fell for him; I think everyone reading the novel might feel the same just a bit. However what I like most of all about this novel is that people and circumstances are never simple. There isn't an easy switch to solve everyone's problems, because that isn't real life. People don't always behave so well but that doesn't preclude them as bad people, just as other people might end up having to deal with more than their fair share of trouble, but unfortunately life is like that sometimes - not always fair. You, Me, Everything conveys all of this without being overly depressing - there's certainly times when I felt upset and shed a tear (or two...or a hundred) but there were other times where I smiled. It addresses some really important issues and I loved Catherine Isaac's writing. You, Me, Everything is a bit of a rollercoaster of emotions at times, but it's a brilliant read and I loved being along with them for the journey. A classic chic lit romp through the quotidian of everyday life. I am not sure I understand the recent trend to throw a horrible illness into the backstory of cozy fiction. I feel like it’s a stop gap for an otherwise uneventful storyline. Personal opinion. Maybe I’m alone on that one?! So this is the tale of Adam and Jess whom we meet just as they are falling out of love with each other. On the advice from her mother who is suffering from the last stages of Huntington’s Disease (which sounds awfu A classic chic lit romp through the quotidian of everyday life. I am not sure I understand the recent trend to throw a horrible illness into the backstory of cozy fiction. I feel like it’s a stop gap for an otherwise uneventful storyline. Personal opinion. Maybe I’m alone on that one?! So this is the tale of Adam and Jess whom we meet just as they are falling out of love with each other. On the advice from her mother who is suffering from the last stages of Huntington’s Disease (which sounds awful! ), Jess opts to take their 10yr old son William on vacation in the south of France in an effort to grow the relationship between father and son. pen! She has a back for writing places! this time and just didn’t know how to process? handed you an awful hand. Man up and play it anyway! Mellie Antoinette @Alexis You are most welcome! Hang in there. It’s actually a cute book, it just could’ve been so much more! A French charcuterie of cheese ball and idealism. "I've been in the car park since midnight. I didn't want to get stuck in the traffic ." I fell in love with her !! And then we have Jess's dad, who is an accountant, who has taught the love of numbers to William and is more of a father to William than his biological father. Adorable ! So far it's been good. The scenery now changes to France where Adam currently renovates and manages some chateau. Jess and William have come to visit Adam on request of her ailing mother. Cue, Adam !! Adam is like 30 going 17. He is annoying, self-centered and at times even uncaring, which pissed me off specially when he put his girl friend's wishes before his son's wishes. We also get to meet Jess's friends. We have Natasha, who is hot-bigshot-single-ready-to-mingle kinda woman and we have Becky who is married to her childhood sweetheart and has 3 children who drive her insane. Things start getting a little slow here onward. We get glimpses of problems in Becky's marriage and how Natasha is falling for a man younger than her, who BTW also has to compete with another self-obsessed man.Too much drama ! And not relevant to the plot at that ! So, we get to see Adam taking some effort to spend more time with William. We have a jealous Simone (Adam's gf) who is trying to snag Adam's attention. Scenes where Adam lets down William and Jess has to make up lies to keep him from getting hurt are heart-breaking. Adam is still way to self-centered till this point. Enter, Charlie ! A very rich man who is living in the chateau and has eyes on Jess. She flirts with him and enjoys the attention. And then suddenly we have scenes where Adam is apparently disturbed with how close Jess is with Charlie ! Really ?? And to add to my woes, Jess is also reminiscing her golden days with Adam and her feelings for Adam are growing despite knowing his history. Seriously ? My mind cannot just accept that Adam now is willing to get together with Jess, so easily, after immediately dumping his current gf.. Everything feels so rushed !! All in all, I think Jess's mom and dad had more chemistry and heart breaking love than Jess-Adam! I just did not feel the pain or heart break when it came to Adam. Yah, he has agreed to keep up his marriage in sickness and in health, but it seems he has got it too easily. I agree that Adam and Jess's misunderstanding from the labor night, showed a sweet side to Adam. But, that simply did not negate his other problems and actions. And though he realized in the end that he could have fought and stayed to make their relationship work, the fact of the matter is he took the easy way out then !!! Why is he having it so easy now ?? I wish Jess would have tried a relationship first with Adam, and not just jumped into marriage. I wish Adam could have overcome his insecurities and been a deserving father to William before they married. I wish Adam could have been included in the scenes of Jess's mom's final moments, something to assure us that he knows what he has signed up for.. It feels so incomplete ! The one thing that definitely deserves to be mentioned first is how there are so many hard topics tackled in this novel. From illness to alcoholism to being a single parent to the pressure kids can have on a relationship - it's all there! And all those topics made this book that more amazing to read because they are incorporated in a real, genuine way that made my skin crawl at times. You can feel the hardships all characters are dealing with - purposely not mentioning names because spoilers, doh The one thing that definitely deserves to be mentioned first is how there are so many hard topics tackled in this novel. From illness to alcoholism to being a single parent to the pressure kids can have on a relationship - it's all there! And all those topics made this book that more amazing to read because they are incorporated in a real, genuine way that made my skin crawl at times. You can feel the hardships all characters are dealing with - purposely not mentioning names because spoilers, doh! One thing I had to laugh about but, more like a stupid laugh, was William - Laura's son - who's absolutely addicted to his mom's iPad. I feel like this is something a lot of parents struggle with. Trying to keep the kids away from constantly staring at a screen one way or another and that was shown pretty brilliantly in You, Me, Everything. I also really loved the short chapters - or at least they felt really short to me. I even jotted down that I was at chapter 37 when I was 33% in and that felt, to me, like I didn't even read that much but seeing the chapter number was... enlightening? And maybe I should mention how I totally did not know this novel is quite lengthy but I didn't even notice that at all while reading. I only found out about that afterwards! One thing that kind of annoyed me a bit, was Laura's naivety. She's a single parent, she brought William up all on her own - well, together with her parents - and yet she can still be so naive when it comes to certain things.. It did my head in at times. That's totally me and someone else reading You, Me, Everything might not be bothered by it at all though! This book fell a little short for me. Just, underwhelming considering I thought it might be like Jojo Moyes' Me Before You or just Moyes' writing. The only comparison? It's a love story. And, one I didn't enjoy very much. Nor, did I like the way the book was written- it was unnatural. The reader was told too much too soon. There was no anticipation, until near the end but everything else was immediately put out there. I had no curiosity for the story being told and so, it wasn't nearly as gripping as it could have been. This was also because the reader wasn't really given an opportunity to warm up to any of the characters, or connect with them. This is a story about a love surviving against the odds. Jessica is a new mother, her boyfriend Adam failed to witness their first child's birth. He wasn't there when she needed him. Their relationship falls apart shortly after. Jessica's mother was there, Jess has come to rely on her, appreciate her more. Shortly after, her mother is diagnosed with Huntington's Disease. Ten Years Later: Jessica thinks she ought to reignite the relationship between her son and his father, for practical reasons. They're going to spend a holiday together. Things have changed: Adam has a girlfriend and his life is in France. In short: he's unavailable. But for how long? This is a heart warming story, I sympathised completely with the family but where the author was striving to be funny, or make light of situations it didn't work. This story was much too serious for my taste. I also didn't like the choice Jess ultimately made, it didn't feel fully justified and it seemed like it was based on their intimacy. But begrudgingly, I could understand her desire to reunite her son with his father. It suggested responsibility but doing what she ultimately did felt out of character. It was unexplained, but the author knows the characters better. Also disagree with the sentiment 'When you are surrounded by love, you have nothing to fear.' The book itself disagrees, you are fearful of heartbreak, loss, fate. The sentiment almost tempts fate, something I fiercely despise. I found a lot of the dialogue was guilty of the same crime. Telling someone it will all be okay, that they will have a good life- when life is by nature uncertain- is high on my list of pet-peeves. Side note: the cover is rather genius. Una historia aparentemente sencilla que nos demuestra de forma tierna y a veces divertida lo maravillosa y desgarradora que puede ser la vida. A partir de ese anhelo de una madre por seguir los deseos de su madre enferma, la novela nos permite acercarnos a una pareja que dejó de serlo hace 10 años, a sus desencuentros, a su niño y el amor esperanzado por su padre, a la verdad de la vida, y a cómo debemos seguir avanzando. Sin ser un texto demasiado intimista, la autora consigue que la historia p Una historia aparentemente sencilla que nos demuestra de forma tierna y a veces divertida lo maravillosa y desgarradora que puede ser la vida. A partir de ese anhelo de una madre por seguir los deseos de su madre enferma, la novela nos permite acercarnos a una pareja que dejó de serlo hace 10 años, a sus desencuentros, a su niño y el amor esperanzado por su padre, a la verdad de la vida, y a cómo debemos seguir avanzando. Sin ser un texto demasiado intimista, la autora consigue que la historia penetre en ti. Narrada desde el presente, en primera persona, ELLA nos va dando las pinceladas necesarias según acuden a su mente sobre lo que es, lo que fue y cómo han llegado hasta donde están. No pensaba que iba a ser de esta manera; que me iba a gustar tanto a pesar de su sencillez y aparente simpleza, que iba a empatizar tanto con los personajes y su forma de enfrentarse a las dificultades, y que iba a ser una novela tan tierna, con su toque triste y su toque, en cierta manera, romántico. Wow! What a brilliantly written, lovely book. Everyone: you HAVE to read this if it's the only one you read this year. Just make sure you have the tissues handy though as it WILL make you laugh and cry throughout its pages. This was a DNF for me. Oh My Heart! I just need to take a little breath before I write this review, because this book is just so incredibly gorgeous. It is such a beautiful book. It made me laugh, it made me cry, and I fell in love with all of the characters. I couldn't focus on anything else while I read this book, set in the beautiful Chateau de Roussignol, in the French countryside. It waa all consuming. It's a book about lost love, about paternal lov, about the love between mother and daughter, and the love that ru Oh My Heart! I just need to take a little breath before I write this review, because this book is just so incredibly gorgeous. It is such a beautiful book. It made me laugh, it made me cry, and I fell in love with all of the characters. I couldn't focus on anything else while I read this book, set in the beautiful Chateau de Roussignol, in the French countryside. It waa all consuming. It's a book about lost love, about paternal lov, about the love between mother and daughter, and the love that runs thriugh the veins of a family. It is a love story on so many different levels, and as you can probably tell, I loved it! The novel begins with Jess giving birth to William. A baby that Adam was unprepared for, and whom he left behind not long after the birth. It was Jess's mother and father who supported her for the fhrst ten years of William's life. Then fast forward ten years and we have the situation that is now. Jess wants her son to form a relationship with his father, and so she makes the decision to holiday in France, where Adam now lives and works. During Jess and William's summer vacation to reconnect with Adam, their lives will change forever. That is all I will say. I don't want to give anything away. This is such a delightful read. The writing is beautiful, lyrical and so very down to earth. The characters are real on the page, and Jess in particular completely resonated with me. I understood completely her motives for wanting her son to have a proper family, and to bond with his father. I alao had a soft spot for William. As a mum to two boys, aged 11 and nearly 10, his mannerisms, language and emotions really touched me. I just wanted to put my arms around this little boy and tell him that everything would be OK. I really did go through a whole range of emotions, while reading You Me Everything. This book is both heartbreaking, yet hopeful, romantic and practical. It's a book about the importance of family and how love evolves and is forever changing, but that it is always present. A beautiful story that I will read again and again. I highly recommend it. Enjoy! Recommends it for: readers who go "squeeeee!!!!!" Recommended to The Just-About-Cocky Ms M by: My Evil Twin. Like the ubiquitous headless and beautifully dressed woman on about 80% of historical fiction--most of it bad; the trite and tired "The [fill-in-the-blank] Wife/Daughter/Whatever that provides a Big Clue that the author is equally trite; and the appalling plethora of titles featuring the "You Before Me/Me after You/You Me and the Damn Dog, this lightweight, forgettable, and ultimately boring novel lives up to its banal title. Because I'm a sucker for books set in France, eith Like the ubiquitous headless and beautifully dressed woman on about 80% of historical fiction--most of it bad; the trite and tired "The [fill-in-the-blank] Wife/Daughter/Whatever that provides a Big Clue that the author is equally trite; and the appalling plethora of titles featuring the "You Before Me/Me after You/You Me and the Damn Dog, this lightweight, forgettable, and ultimately boring novel lives up to its banal title. Because I'm a sucker for books set in France, either historic or contemporary, even when I've often been disappointed. The setting for this insipid tale is a chateau in the Dordogne with the improbable name of Chateau de Roussignol--perhaps the author was going for "rossignol," which means nightingale? Irrelevant, since neither the chateau now turned renovated hotel by Adam, the main character Jess's boyfriend and father of her son. That much is accurate since this region of France is literally overrun by Brits and Belgians scarfing up the real estate. The rest of the alleged French atmosphere? Alas, it is subsumed by the most unlikable, smarmy, selfish, and self-centered collection of characters I've encountered since, oh, I don't know--the last yukky book I read? The allegedly heart-rending issue of disease is as about as moving as a Lifetime Disease-of-the-Week movie, and the way this cardboard trio of characters handle it is decidedly heavy-handed and oh-so-predictable. I knew where this was headed by the first third of the book, and debated bailing out then. But like a toothache that hurts when you mess with it and you just can't stop, the book led me on if only to see if somewhere, at some point there might be a surprise. Go read some of the breathless positive reviews, of which there are plenty, to get a glimpse of the plot, the characters, and all that other stuff that 1is really a book report masquerading as a book review. I will stick to my opinion that the first several chapters, which are supposed to pull a reader in, were a mess of telling with nary a bit of showing to be found, backstory by the boatload, and page after page of some of the most wooden, stilted, and amateurish dialogue imaginable. I'm not quite sure exactly what I expected from this novel, but I got so much more than I ever thought. It will leave you worn out, exhausted - and desperately sorry that you've reached the final page. This is usually where I give a brief outline of the book - without giving away more than the synopsis alludes to, but this time I don't want to expand on the blurb one little bit. This is a book about happiness, friendship, children, relationships, family, secrets and love. It begins as such a ligh I'm not quite sure exactly what I expected from this novel, but I got so much more than I ever thought. It will leave you worn out, exhausted - and desperately sorry that you've reached the final page. This is usually where I give a brief outline of the book - without giving away more than the synopsis alludes to, but this time I don't want to expand on the blurb one little bit. This is a book about happiness, friendship, children, relationships, family, secrets and love. It begins as such a light read and along the way morphs into something very emotional and heart-wrenching. I've laughed, smiled and had tears in my eyes reading this one. Do I regret reading it? Not at all .. I'm only sorry that I'm not just beginning it right now. You Me Everything is one AWESOME read, and a story which will stay with me for a long, long time. I was delighted to read in the acknowledgements that the film rights have been optioned. This is one movie I definitely want to watch! Bloody Brilliant! "Sometimes, it takes darkness to see how we shine." "When you're surrounded by love, you have nothing to fear." A love story unmatched by the struggles and triumphs of a world in which 'trust' takes center stage. Jenn, Adam, and William are on a journey. A journey that helps them define who they are and what they each bring to the relationship. Separately they are fine but together they are magical! Jenn suffers from anxiety, depression, and is currently trying to adapt to having a Bloody Brilliant! "Sometimes, it takes darkness to see how we shine." Jenn suffers from anxiety, depression, and is currently trying to adapt to having a mother with Huntinton's Disease which is genetic. This leads to an uncertain future for each of these characters as love is on the line. Meanwhile, Adam is not a 'constant' nor 'trustworthy' companion. He walks in and out of her life and the only true constant is his lying ways and cheating heart. Or so we are led to believe, because as this wonderful story unfolds Catherine Isaac brings it to a whole new level of excitement. Sometimes what you think you know is not always accurate. ( 35 yrs later of wedded bliss). However, he's still William's father and that right cannot be denied. So, with this unplanned pregnancy and constant cancellation of plans will there be a long term commitment or more of two people going through the motions but never truly connecting? What captures the heart is when Adam gives this statement," I've spent sixteen years trying to get over you. Dating women I've hoped will come close to matching you, then realizing within months, weeks, that none of them could." Life throws curves but how you deal with them is key. Not worrying about the past, nor the future, leads to a promising outlook and foundation upon which to build. So will he or won't he stay involved with Jess and William? Will Adam ever find it in his heart to be the father he knows he should be and the man not the boy Jess needs him to be? Ten year relationship, a baby, a terminal illness, and emotional turmoil all comes to this one moment of truth? You know marriage vows are a serious proposition and is not to be taken lightly. Ok, well true but can this relationship be saved and will it prosper? For me personally this rings true on many levels. My exhusband did the same for much of our relationship. Womanizing, cheating, disconnected, distant, and cold towards his family. If it was a role reversal and by chance he seen the light I'd never go back because of his abusive ways but it goes to show that upbringing , love, nurturing in childhood is as important as the connections we form well into adulthood. This is one of those stories that will resonate long after you've finished and for me it was a 'Cinderella Story' that I only wish could have been true. Love is in the air, and for some they catch it, for others they are simply left brokenhearted. A beautiful story with a happy ending for all to savor. Jess and Adam split up ten years ago; during which time Jess has been single-handedly raising their son William, whilst Adam has been busy making a new life for himself in France. Now Jess decides to take William to France to spend a summer at the hotel that Adam runs, in the hope of encouraging some father and son bonding; though both Adam and William are unaware of her true reasons for doing so. This book is actually by Jane Costello writing under a pseudonym, and I can see why she chose to do Jess and Adam split up ten years ago; during which time Jess has been single-handedly raising their son William, whilst Adam has been busy making a new life for himself in France. Now Jess decides to take William to France to spend a summer at the hotel that Adam runs, in the hope of encouraging some father and son bonding; though both Adam and William are unaware of her true reasons for doing so. This book is actually by Jane Costello writing under a pseudonym, and I can see why she chose to do so, as the subject matter is more sensitive and weighty than in her previous books. Though that being said, the book still had her trademark humour and light-hearted writing style. I have seen comparisons being made to Jojo Moyes' Me Before You, and again I can perhaps appreciate why; though in my own opinion despite the subject matter in this book, it didn't read as emotionally for me as the latter or strike such a resonance. Still that is not to say that I didn't very much enjoy the story. I loved the setting in the south of France and thought that Isaac did a good job of capturing the atmosphere of the place. I also really liked the concept of the story. Without wanting to give too much way, Jess' mother is suffering from a degenerative disease, and coming from a medical background I thought that Isaac portrayed the depiction of the disease's impact on her mum really well, as well as the wider implications for the family. I particularly liked her portrayal of Jess' parent's relationship, and the devotion her father has as a carer. Given the subject material, the book could have been a hard read, but overall the story is an uplifting and heart-warming one, with a lot of lighter moments. Jess and Adam's relationship is central to the book; and whilst at first Adam comes across as a very selfish character, that does change as the story goes on, and actually there were some revelations later that changed my perception of him. I enjoyed watching the two re-connect, as well as seeing Adam's growing relationship with his son. Again flashback chapters to the past helped to flesh out their relationship and capture the connection between them, adding a nostalgic flavour. 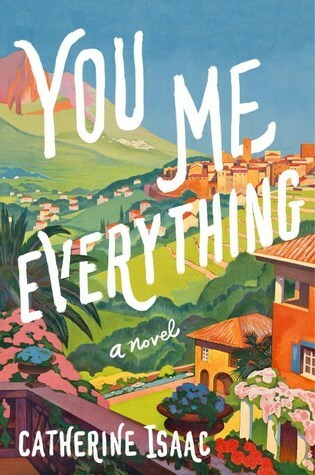 You, Me, Everything by Catherine Isaac is a witty moving novel with just the right balance of romance, humor, and sadness. Since the book is set in the idyllic countryside of the Dordogne valley in France, and the French countryside is one of the top 10 places in the world that I've visited, I could not help but curl up, imagine I was back there on vacation, and immediately get lost in the lush, vivid summer scenery of Château de Roussignol, the castle renovated by Adam, ex-boyfriend (and father You, Me, Everything by Catherine Isaac is a witty moving novel with just the right balance of romance, humor, and sadness. Since the book is set in the idyllic countryside of the Dordogne valley in France, and the French countryside is one of the top 10 places in the world that I've visited, I could not help but curl up, imagine I was back there on vacation, and immediately get lost in the lush, vivid summer scenery of Château de Roussignol, the castle renovated by Adam, ex-boyfriend (and father of her young son) of Jess, the novel's main protagonist. I don't think I put down this novel until I finished it because it was so enjoyable! If you are like me, you will love single mom Jess. She has raised William alone except for the help of her utterly fantastic parents for 10 years after realizing that love was not enough to keep her and Adam together since he just couldn't handle fatherhood. Her relationship with William is loving and sweet, yet so believable! I adored William, who is exceptionally smart, curious, and mature for his age while still teetering on the edge of childhood. I laughed so many times when Jess repeatedly had to tell William to get off the iPad because being a mother of three, that is a daily, real-life struggle! I felt like she was my echo in those moments! As I said, Jess' parent's are wonderful, and they might be some of my favorite characters in the book. It is between her parents that you see the meaning of true love personified. I'm not going to give away total spoilers here because I think it is really important that you read this book and find out about the very important issues these characters are dealing with, but I will say that it is the dying request of Jess' mother, who has a terminal illness that Jess take William to France for the summer, so Adam can connect with him and step up and be a real parent to him. Of course, Jess does what her mom asks, and William is more than excited to spend time with his dad! And who wouldn't want to spend all summer in France at a luxurious castle?? We already know my answer! But can Adam actually be a dad to William after 10 years or is he the same irresponsible father (and man) as before? It's interesting to see how Adam behaves when Jess and William first arrive and then later as the story evolves. He is undoubtedly charming, and I would (possibly) fall for him, so I see why Jess was attracted to him! He certainly has his faults, yet that is realistic too since I don't think anyone is perfect, so again Isaac's has done a fantastic job with making her characters relatable and real. I can definitely understand why the novel has been optioned for a film! Yet my only problem with the book is that Adam and his relationship with Jess and William at the end are somewhat predictable, and his character development was a bit hard to believe when compared from the beginning to the end of the novel. Still, I strongly believe in second chances and that life can be full of surprises! And that is exactly what Isaac gives us in this fabulous novel with its beautiful, poignant storyline that will leave you hopeful about family, second chances, heartbreak, forgiveness, courage, and love. I highly recommend this but have a box of tissues handy! If you are a fan of Jojo Moyes or Jane Green, then you will enjoy Isaac's lovely book. Many glowing reviews here, but although this book dealt with some difficult issues, I had an unshakable impression that this author cut her teeth writing "romances." For me, the giveaway clues were the life-changing decisions made on a minor misunderstanding, the detailed descriptions of rippling muscles, glistening skin and throbbing hearts, the constant push/pull between Our Heroine and Our Hero and the introduction of a Diverting Male. After I finished, I explored her bio and found she had ind Many glowing reviews here, but although this book dealt with some difficult issues, I had an unshakable impression that this author cut her teeth writing "romances." For me, the giveaway clues were the life-changing decisions made on a minor misunderstanding, the detailed descriptions of rippling muscles, glistening skin and throbbing hearts, the constant push/pull between Our Heroine and Our Hero and the introduction of a Diverting Male. Džesė vieniša mama, kuri augina nuostabų sūnų. Nesusiklosčius santykiams su Viljamo tėčiu, su visomis iškilusiomis problemomis tenka jai dorotis pačiai. Tačiau staiga Adamas, buvęs Džesės mylimasis, pasikviečia Džesę su sūnumi pasisvečiuoti į jo vilą Prancūzijoje. Adamas anksčiau nebuvo itin tėviškas ir di Vos tik pažvelgus į šios knygos viršelį galvoji - vasara.. 😍 Taip taip, šis pasakojimas susijęs su karščiu alsuojančia Dordone. O ši knyga buvo tai, ko man būtent šiuo metu reikėjo ir norėjosi. ספר חמוד ביותר. אני בדרך כלל נותנת לספרים מהסוג הזה 3 כוכבים, אבל הפעם החלטתי לצ'פר בכוכב נוסף כי אהבתי מאוד את האפיון של הדמויות. הן אנושיות ועגולות. הקצב היה קצת איטי עבורי בהתחלה, אבל אחר כך הגיבורה מציינת שהיא סובלת מדיכאון, ופתאום הכל הסתדר לי בראש מבחינת קצב הסיפור. ההתנהגות שלה ואיך שהיא מתבטאת באמת מאוד מתאימה לזה. זה היה אחד הדברים שהרשימו אותי מבחינת הכתיבה. It was sad... it was happy... it was emotional... it was everything. Oh, this book really got to me and it is a story that will not be easily forgotten. Jess and Adam fell in love but it wasn't enough to keep them together. Ten years later and at the request of her beloved mother who is fading away before their eyes, Jess is heading to France with her amazing ten-year-old son so that Adam can form a real bond with their child. And who wouldn't enjoy a few weeks in a lovely chateau in the beautiful French countryside? But with worries from home crowding in on her Oh, this book really got to me and it is a story that will not be easily forgotten. YOU, ME, EVERYTHING by Catherine Isaac is such a wonderful story and I couldn't put it down. The characters are real, relatable, witty, and loveable, and they brought the story alive in ways that are hard to describe. The setting in France is stunning and you could easily imagine yourself relaxing there beside the pool. I loved Jess's friends and William is such a great little boy that you cannot help but love him. There were moments in this story when I laughed and definitely moments when I cried but the most important thing I took from YOU, ME, EVERYTHING is that life is for living - every second, every minute, every hour is precious and we should all appreciate and embrace that fact. I loved this book, i loved the way the story was told and I loved Jess as a lead character. This books is exactly what it says it is, heartbreaking and hopefully all the same time. You will not want to put it down once you have picked it up because Jess is such a great character to spend time with, but also you will need to know what is going to happen next. As soon as I started reading this book, I felt like I just needed to settle in for the night because once I was there, there was no way I w I loved this book, i loved the way the story was told and I loved Jess as a lead character. This books is exactly what it says it is, heartbreaking and hopefully all the same time. You will not want to put it down once you have picked it up because Jess is such a great character to spend time with, but also you will need to know what is going to happen next. As soon as I started reading this book, I felt like I just needed to settle in for the night because once I was there, there was no way I was moving. Catherine Isaac was born in 1974 in Liverpool, England. She gained a degree in history at the University of Liverpool, then studied journalism at Glasgow Caledonian University. She began her career as a trainee reporter at the Liverpool Echo and went on to became Editor of the Liverpool Daily Post. She wrote her first novel, Bridesmaids, while on maternity leave and under the pseudonym Jane Costell Catherine Isaac was born in 1974 in Liverpool, England. She gained a degree in history at the University of Liverpool, then studied journalism at Glasgow Caledonian University. She began her career as a trainee reporter at the Liverpool Echo and went on to became Editor of the Liverpool Daily Post. She wrote her first novel, Bridesmaids, while on maternity leave and under the pseudonym Jane Costello. She since wrote nine books, all Sunday Times best-sellers in the UK. 'You Me Everything' is her first novel writing as Catherine Isaac. Translation rights have been sold to 20 countries and a movie has been optioned by Lionsgate.